Valentine’s Day is tomorrow. Any big plans this weekend? I’ve got a couple of things happening but more on that later. Today I’ve done some nails based on some details from a dress of mine. I don’t always match my nails to my clothes. But when I do it is awesome! For this look I started with my go-to pigmented-but-a-pain-to-apply-white (Yeah, I need to find a white I actually love). 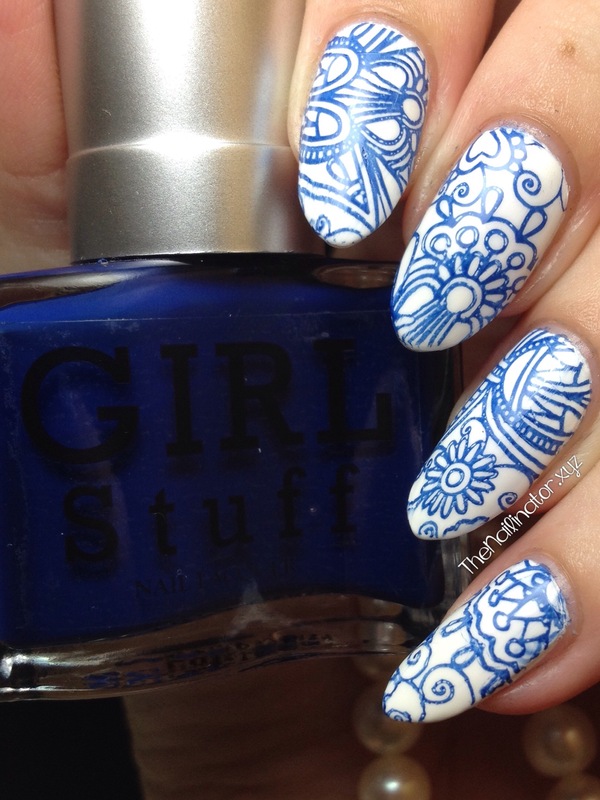 Then I stamped using Girlstuff Blues an awesome design from the MJXXVI plate sent to me by My Online Shop. As I expected, this plate stamped beautifully. I love that we have high-quality plates available locally. Meann also sells the squishy white stamper that will make stamping a dream. 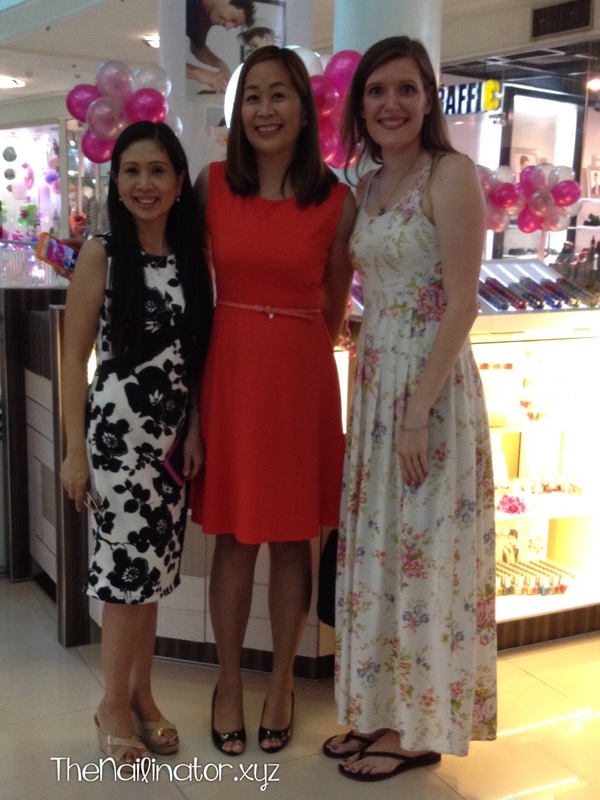 I bought a gorgeous party dress this week at a little boutique here in Cebu called Best Finds Thriftshop. I plan on wearing this dress to a Valentine’s dinner tomorrow night. We have some games planned and a potluck dinner. There will be baby sitting, so no interruptions. Yay! I’m also going to a blogger get together on Sunday night. 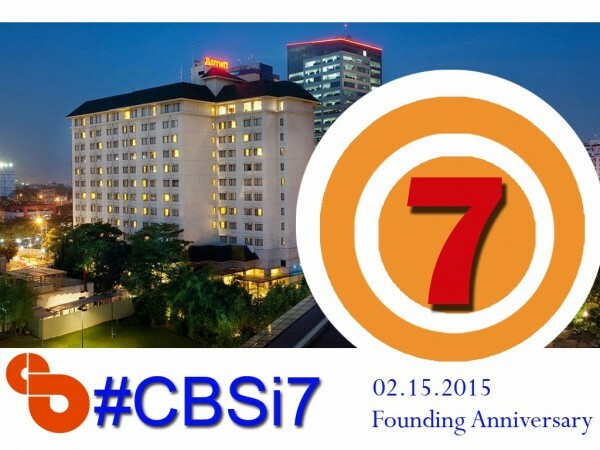 The Cebu Bloggers Society is celebrating it’s 7th founding anniversary, and they have invited members to get together to celebrate. I just recently joined the Cebu Bloggers Society. I don’t get to go to many events because what I actually blog about is very limited, but I’m still proud to be a member of a group of bloggers dedicated to making our city and our world a better place both from behind the computer or as we go about our daily lives. I love how bloggers across the board can, in their own ways, promote local companies and brands and especially come together and use social media to inspire people to be better and to help in times of crisis. I look forward to meeting all the new faces. The Cebu City Marriot Hotel is graciously providing a venue for the bloggers of Cebu to come together and get to know one another better. I’m looking forward to it! No matter what you are up to this weekend, I hope you have a lovely time doing it. Make someone smile! The Nailinator Gets a Makeover! Hello from my new site! I have been wanting to update my blog look for a long while now, and Mr. Nailinator—good-looking, tech-savvy man that he is—said he would do it for me if I could just tell him what I had in mind. So he has been working hard in his spare time making my vague dreams a reality. Thanks again, honey! Goodbye old, cramped spaces! Hello clean, fresh look. I need feedback people! Do you like it? Also check out my web address! 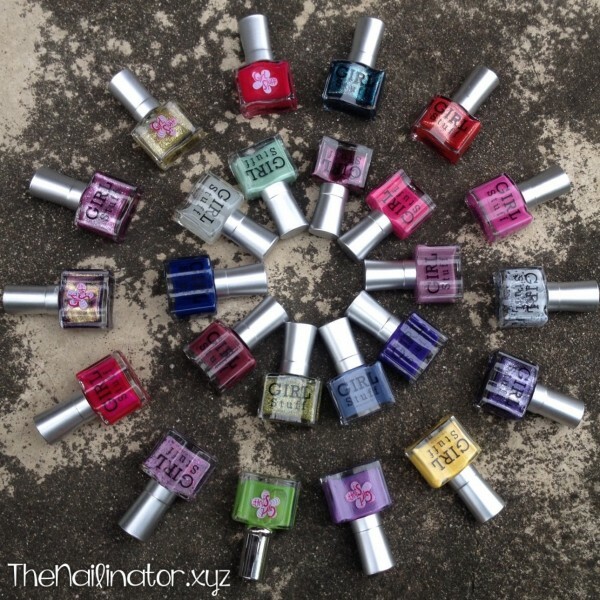 I waited for over a year for thenailinator (dot) com to be available because someone had just bought it when I went to buy it last July. We saw that the owner renewed it a couple of months ago, so Mr. Nailinator got me the .xyz which (according to him) is the new .com. We’ll see about that. Anyhooo…the people with the .com refused to give it up despite them not even using it at all for over a year now. They said they had future plans for it. Well, good luck with that because I already have all the social media accounts for The Nailinator. Speaking of social media, would you just look at those adorable nail polish bottle buttons my man made for me!?!?! Just look at them! Aren’t they adorable? Click on them and check out my social media accounts and please do sign up for email notifications if you haven’t already. I hope you love the new look as much as I do. Have a great week! Girlstuff Joy and My Blogiversary! Happy New Year! I hope you have had a fun 2014 so far. We were able to spend a week with some dear friends relaxing and laughing the days away. 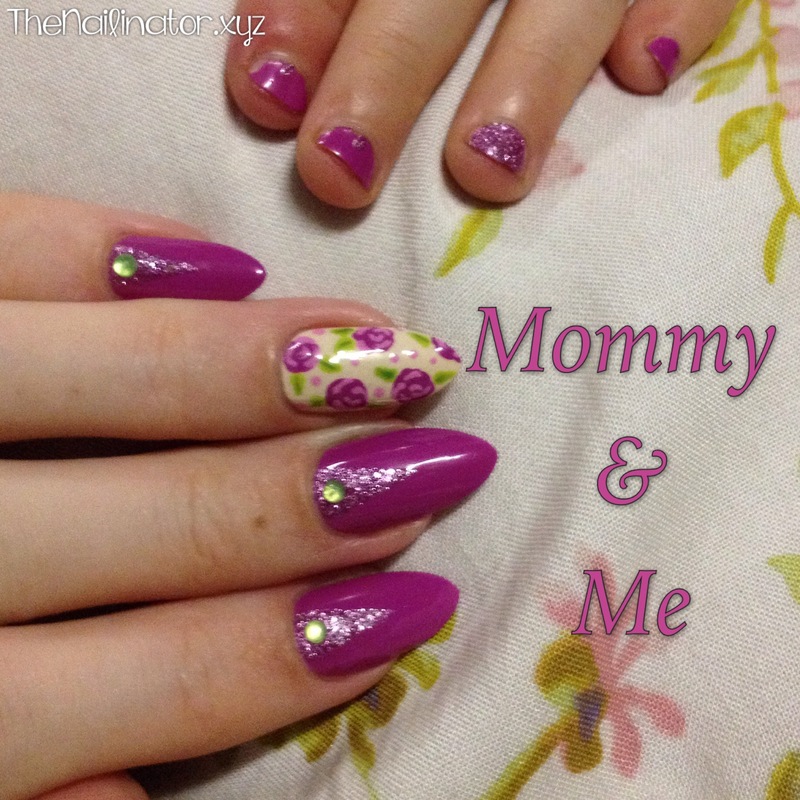 I did nails for several people and it was a lot of fun. That explains my absence around here these past few days. You may not realize it, but it was one year ago today that I decided to take the plunge and start my blog. Happy Blogiversary to me! You can check out my very first post here. I’m amazed at the feedback I have received. Thank you all for your support for me and my blog this past year. I am so glad to have such great gals (plus the handful of guys out there, yeah, I know you are watching, too) interested and inspired by my nail art. I have to thank my husband for being ridiculously supportive and willing to teach his tech-challenged wife about HTML and how to use different social medias. I also have to thank my mom and the Shutterbug for encouraging me to start this blog in the first place and not letting my self-consciousness and insecurity stand in the way of sharing my passion with the world. I have had so much fun getting to know you and making friends with many of you via email and FB. Your likes, shares, and comments mean so much to me. 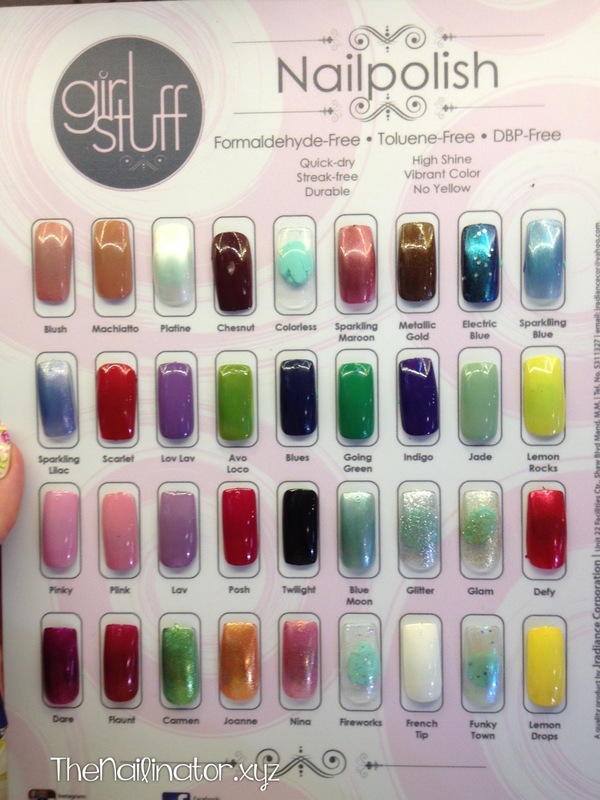 Here’s to more fun and fabulous nails in 2014! 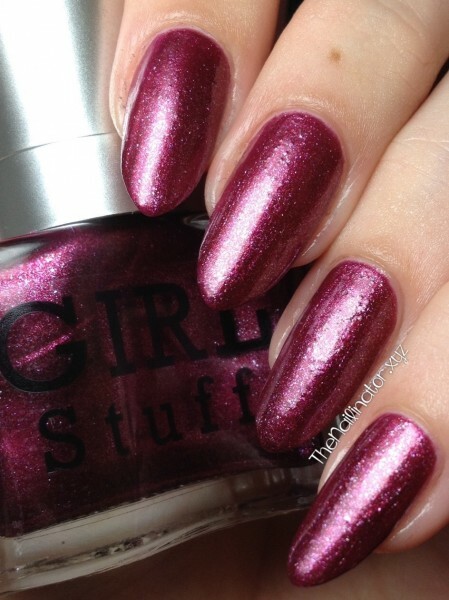 Hoping our year is filled with joy, the polish I’m sharing with you today is Girl Stuff “Joy”. 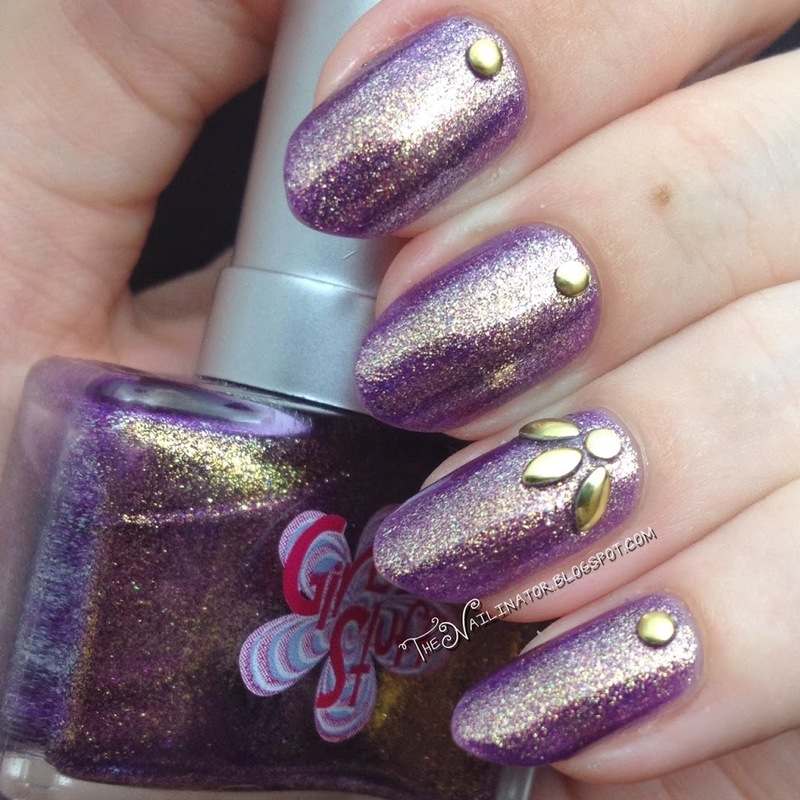 Joy is a gorgeous purple with loads of shimmery gold. I’ve used two thickish coats as the formula is a bit on the jelly side. I LOVE this polish! The purple is a beautiful shade, but the gold shimmer just makes me flip over this polish. It is so interesting and sparkly. Application was easy, and cleanup was a breeze too. 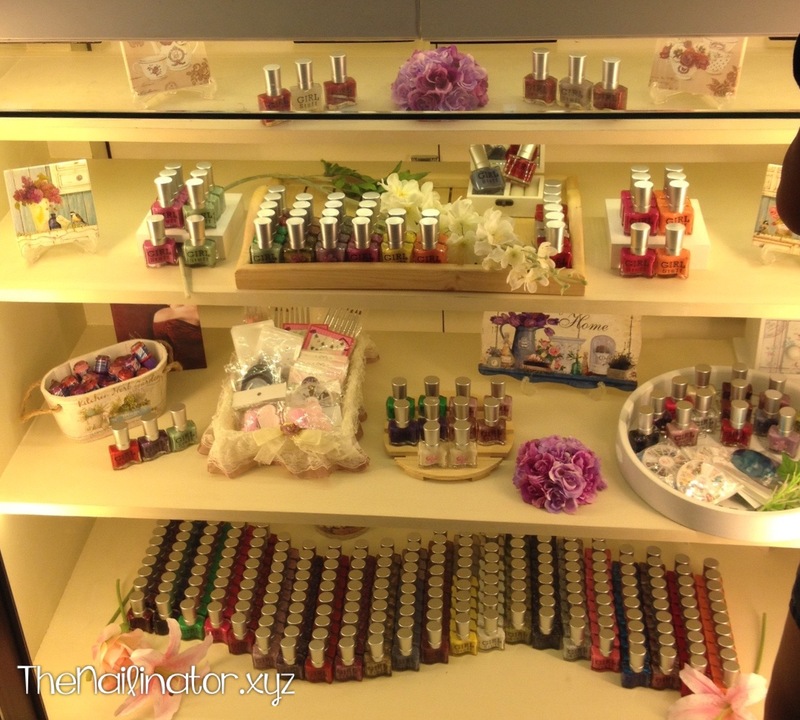 As you can see, I also added some studs I purchased from Blooming Nail Cebu. My nephew asked me why I had seeds on my nails. Ha! Here it is on its own. I acquired Joy when I won my very first giveaway a while back. I won Natalie Brookes’ Instagram giveaway and I love the prizes! I won 4 girl stuff polishes, 1 full sized Seche Polish (not pictured because I’m a goof and spaced out) and a Seche travel French manicure kit. 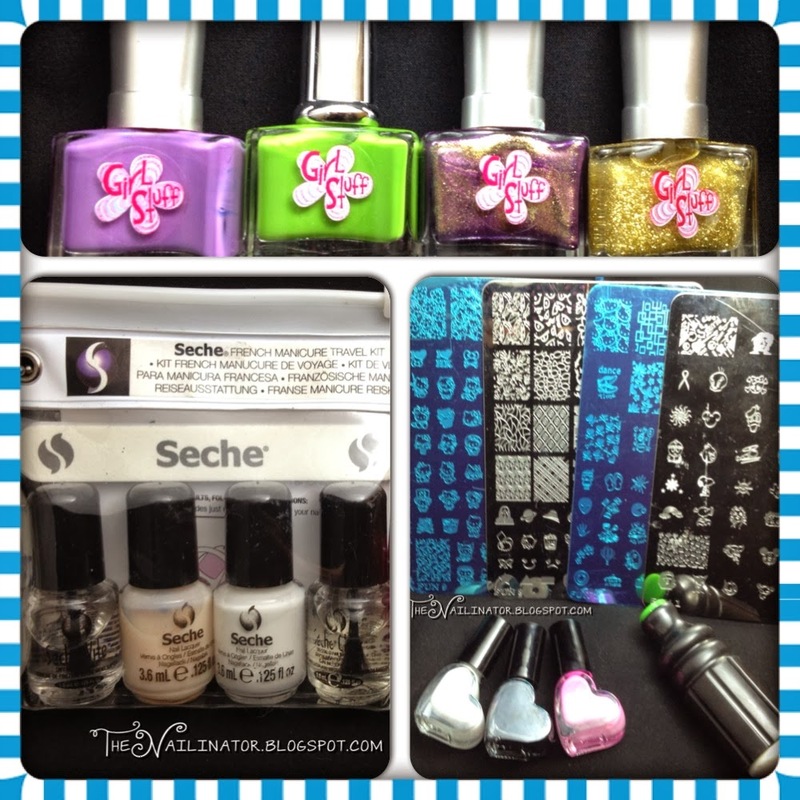 I also won an XL Stamper and 3 special stamping polishes and four XL stamping plates. 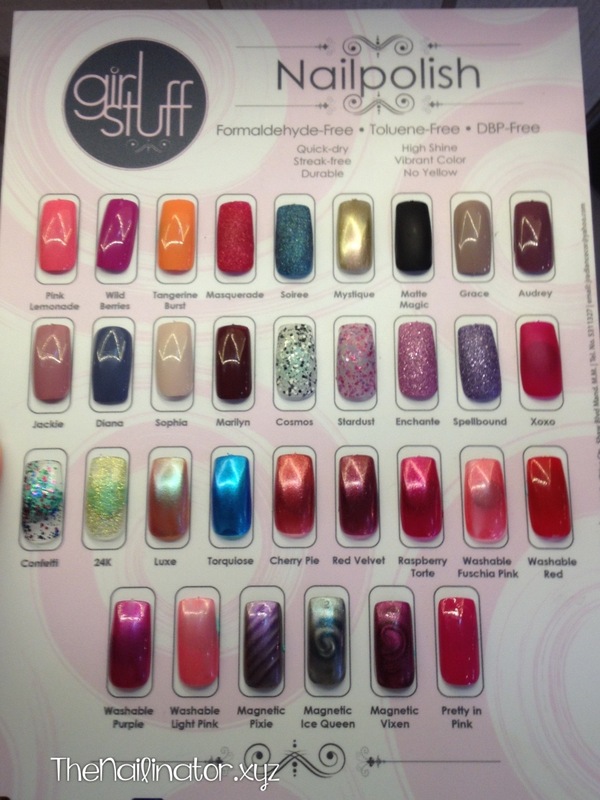 Lots of awesome goodies! Thanks again to Natalie for the giveway! Well, that’s it for me today. I hope you have had a great weekend and that you have a great week ahead. Hugs to you all! Remember a while back when I told you all about how I had been nominated for a Best Cebu Blogs Award? My heart began to race when I received an email this week telling me that I’m a finalist! I am so full of gratitude to be recognized for my effort and so excited to be a part of the Best Cebu Blogs Awards! Thanks toeveryone everyone who voted for me. I’ll let you know how it goes.I was so reluctant to start this blog at the beginning of this year, but I have NO regrets. I appreciate all my followers and the new friends I have made this past year. Although it has been hard to keep up with two kids, some health issues, the home, and blogging, it has also been so much fun! Your “likes”, shares and comments mean so much to me and I hope to continue to come up with some great designs to share with you. Who knows? Maybe we can change the world in our own little ways as we go along. Check out my last post to see how you can help people in the Philippines. Thanks Best Cebu Blogs Awards! Best Cebu Blogs Awards is an annual recognition of bloggers who continue to provide valuable content to their audience and affecting change on other people’s lives. This year, the awarding ceremony will be held on December 7, 2013 at Avalon, Cebu Business Park. This Awards Night will be hosted by Best Cebu Fashion Blogger of 2011, Eden Villarba. There are some awesome sponsors for the BCBA this year.